View of the toll bridge at Williamsport which is now the Rt. 11 Bridge. 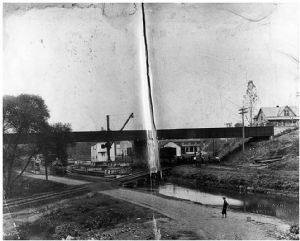 The temporary railroad bridge across the canal was built in 1923 by the Potomac Edison Company to transport coal across the canal. That same year a steel lift bridge was constructed to allow canal boat traffic to pass underneath. In 1924 the canal was severely damaged in a flood stopping all boat traffic and the lift bridge would rarely be used thereafter. The building at the head of the Rt 11 bridge, on the right of the photograph, is the toll house. This was a toll bridge until 1958.